It must have been a news article on the occasion of a report from the Netherlands Institute for Social Research (Sociaal en Cultureel Planbureau; SCP) where I read this interesting observation: the Dutch upper class is both very open and closed. This outwardly nonsensical statement could be rephrased by saying that the Netherlands has ‘closed meritocracy’. It is very possible to join the elite, but once you have been allocated to a group, the borders close. Subsequently, there is very little interaction amongst the different groups. This is the direct consequence of the Dutch educational system. Our school system in the Netherlands has three (four) tiers. After an optional stint at nursery school each child has to go to primary school for eight years when they turn four years old. An exam and the opinion of your teacher determines to what kind of secondary school you will go; your educational level is determined when you are twelve. In theory you can stack levels, but that rarely happens. Only the highest level, VWO, grants you direct access to an academic Bachelor. The consequence is that once you get into the right secondary school and manage to stay in, your membership of the middle or upper class is virtually assured. Starting from puberty Dutch children are socialised into their stations in society. This allows everyone, even those from humble backgrounds, to learn ‘proper’ behaviour and keeps them on track to finish with the rest of their cohort. It also clearly demarcates the boundaries between the classes. People who are part of the elite not because of inalienable birthright constantly have to signal and stress their belonging. My background is not humble, but it is also not spectacular. I come from a countryside family, and my brother and I are the first to go to university. In the Dutch system this is perfectly possible. Once we will graduate with a master’s degree, we will be part of the upper middle class. With that comes a set of thoughts, behaviour and social spheres that are very different from those of the world in which we grew up. Our meritocracy is open, because everyone can be selected, but closed, because the separation seals the groups off socially at a very early stage. Dutch society in the past was plagued by what is called the verzuiling, the ‘pillar-isation’. Everyone was part of their own group. You had the labourers, the Catholics, myriads of Protestant denominations, the urbanite left-wing, and so on. These groups had their own news papers, public broadcasters, social organisations, political parties, and even shops. Even though the other was better, my grandparents would only shop at the baker who went to their church. These denominational pillars are gone now. But commentators argue, and I agree, that a new kind of pillar system has come up: education. Whereas in the past people with different educational levels could be found in one pillar, these days different educational classes lead different lives. Papers and political parties seem now to be speaking to the world views of distinct educational groups—de Volkskrant used to be the Catholic daily, is now the paper of the centre-left elite—rather than of different religious or political convictions. If you have money, you go to concept stores, if you need to watch every penny, you shop at Aldi or Lidl. There is very little exchange between the educational classes. SCP research showed that people marry within their class, have friends within their class and live amongst their class. When I leaf through the country’s main tabloid I see a different country. The SCP argued that one important change with the past is that there are less people in the lower educated group that are there because they missed out on educational opportunities. Where I come from it was not uncommon in the past for parents to send their children to lower-level secondary schools than possible, because that was what befitted their station. Nowadays that would be unthinkable. Study finance and the growth of universities and polytechnics have done the rest. In other words: it seems that our meritocracy is working well, but because of that is only making inequality worse. The current situation of deep cleavages is not conducive to the solidarity that is necessary to keep up our welfare state. If there is no interaction amongst the classes, there is no understanding of what matters to people outside your own group. A clear example was the public outrage against salary increases for the directors of state-owned (because state-rescued) bank ABN AMRO of €100,000 a year. When the bankers appeared before a parliamentary commission they were incredulous. To them it seemed very reasonable. Worse is that empathy is necessary for the good functioning of our government. Policy makers need to have some relation to the life world of all classes in our society. If voters all live in their own world, they will drive their parties to different extremes and be estranged from politics when inevitably compromises have to be made that seem inconceivable from the voter’s perspective. Another issue is that the meritocracy is not entirely fair. The primary school teacher’s advice matters more than the final exam when it comes to your secondary school level. It is a well-known fact that non-white pupils get lower advices than white pupils. When I tried to find the recent newspaper article to support this claim, I instead found one from 2007; this issue has been playing for a while. Moreover, social mobility is never absolutely blind to background. Children from parents with an academic background have higher changes of making it to university too. This is in part related to natural selection, but has also to do with their environment: better family life, more stimulation, better neighbourhoods with better schools, and so on. As the educational classes become more physically concentrated, this disparity will only become more pronounced. What can be done against this? Discrimination is obviously something that has to be eradicated via action. But if besides that our meritocracy works well, the education system ought to be left alone. Instead, we should look carefully into ways to weaken the walls between the groups. Perhaps one solution can be gleaned from officially multiracial Singapore. There, around 80% of all housing is public and the government uses that to enforce a policy whereby every flat has to reflect the ethnic composition of the population. The Netherlands, whose urban planning was a source of inspiration for Singapore, could be inspired in its turn: the government ought to make neighbourhoods a reflection of the educational composition of our population. 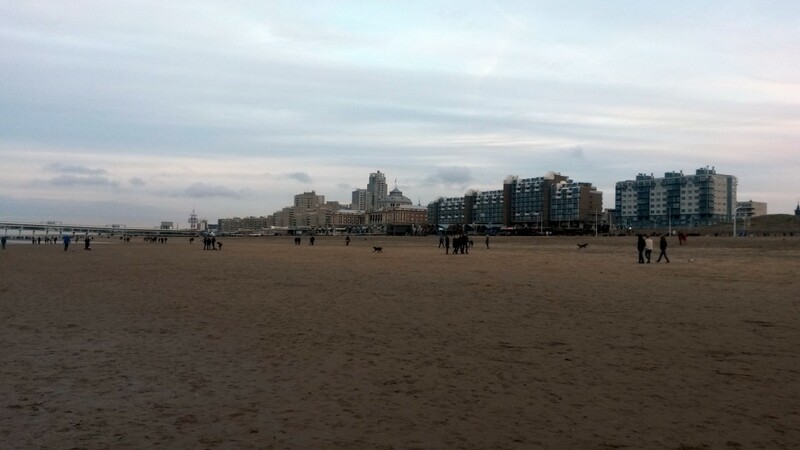 Kurhaus and apartments at the beach in The Hague.